Credit & Copyright: NASA, Lockheed Martin Co. Explanation: What will passenger airplanes be like in the future? To help brainstorm desirable and workable attributes, NASA sponsors design competitions. 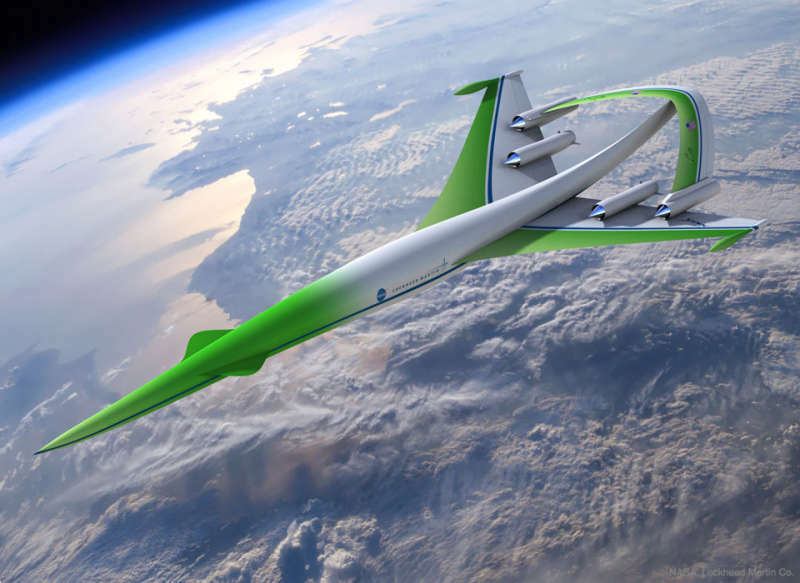 Shown here is an artist's depiction of a concept plane that was suggested in 2010. This futuristic plane would be expected to achieve supersonic speeds, possibly surpassing the speeds of the supersonic transport planes that ran commercially in the late twentieth century. In terms of noise reduction, the future aircraft has been drawn featuring an inverted V wing stretched over its engines. The structure is intended to reduce the sound from annoying sonic booms. Additionally, future airplanes would aim to have relatively little impact on our environment, including green limits on pollution and fuel consumption. Aircraft utilizing similar design concepts might well become operational by the 2030s.